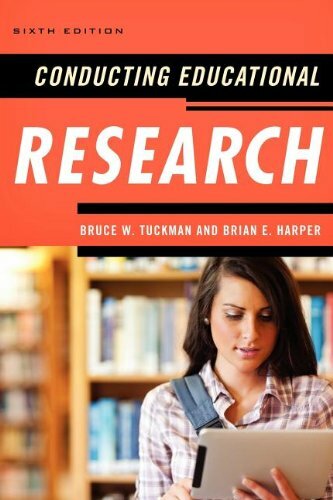 Amazon.com description: Product Description: Conducting Educational Research, Sixth Edition thoroughly addresses the major components of research design and methodology. The text is especially useful for inexperienced student-researchers and doctoral students in the early stages of preparing a dissertation. The early chapters of the text clearly describe the process of selecting a problem, reviewing the literature, constructing a hypothesis, identifying and labeling variables, and constructing operational definitions. The later chapters assist students in refining methodological procedures, analyzing data, and writing the final research report. The clarity of the text and the numerous practical examples help to reinforce important concepts and key ideas, increasing the efficacy of the text for even the most inexperienced student-researchers. Additionally, sample studies are included as models of acceptable published research and serve as a guide against which students may evaluate their own work. Expanded to include additional ethical considerations when conducting research. Renamed "Carrying out Fundamental Steps of Research"
Renamed "Carrying out Quantitative Research"
Additional chapters on experimental research, correlational and causal-comparative research, survey research, and evaluation research. About: Conducting Educational Research, Sixth Edition thoroughly addresses the major components of research design and methodology.